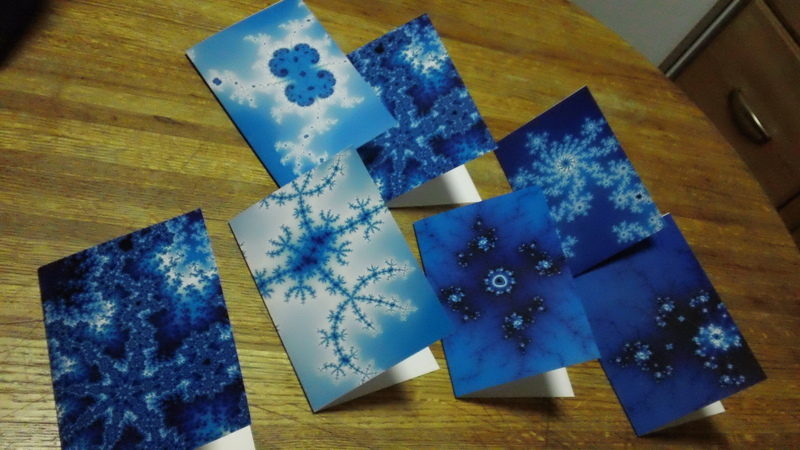 It’s that time of the year again: I’m making my fractal Holiday cards! I slacked last year and only made a few, but I’m back at it. Previous years, I’d made up fractals for my cards. This year I just explored the Mandelbrot set and found cool looking regions. Since I obsessed over my choice of pictures, it took me a while to make them — I’ve made about twenty so far, and still need to make more! It was time well spent, though, since picking the pictures gave me time to reflect on the variety one can find within the Mandelbrot set. While well aware of the mathematical elegance of the Mandelbrot Set, I’d started to forget about what one could find deep inside it… Yay, reminders! This entry was posted on December 24, 2011 at 01:25 and is filed under Uncategorized. You can follow any responses to this entry through the RSS 2.0 feed. You can leave a response, or trackback from your own site.